We are excited to bring our lacrosse education platform to Bergen County! We are excited to bring our lacrosse education platform to Bergen County. DEWLAX specializes in technical and tactical training for young lacrosse athletes. We provide camps, clinics and elite tournament teams to the community with a strong emphasis on 1:1 player development and strong fundamentals. We also provide college recruiting services for those athletes who are interested in playing at the next level. 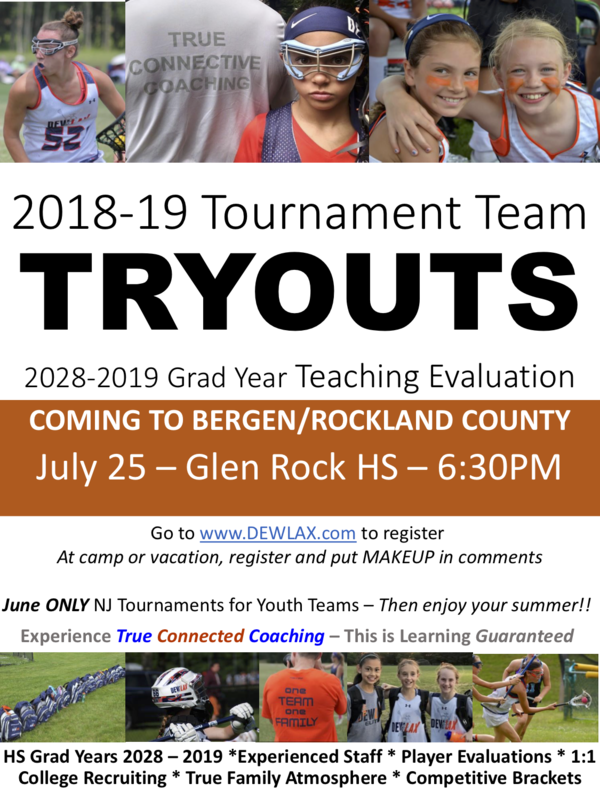 We are having a tryout at Glen Rock High School where we will evaluate and offer instruction for athletes from HS Grad years of 2028 through 2019. Our tryout is a great opportunity to experience True Connective Coaching! Please come on out and experience what DEWLAX is all about. Teams will be based in Bergen County, winter training will be done at the Sports Domain Academy in Clifton, NJ.